This unique natural facial cleanser gently but thoroughly whisks away the surface oils, make up, dirt and grime buildup from the day. Infused with a potent botanical blend, this facial cleanser works hard to hunt free radicals and calms redness, without drying out your skin. 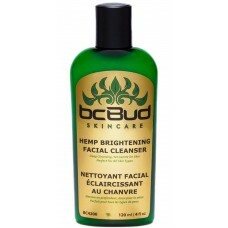 Specially formulated with hemp seed oil, which is known for its natural anti-inflammatory, antioxidant and emollient properties, this facial cleanser leaves your skin radiant, soft and smooth. The effort to achieve a clean, glowing and younger-looking complexion doesn't just stop there. We have also included aloe vera leaf juice and cucumber extract to soothe and tighten your skin, chamomile flower extract to calm irritation and redness, and our exclusive Moisturizing Complex, to nourish and hydrate your skin. 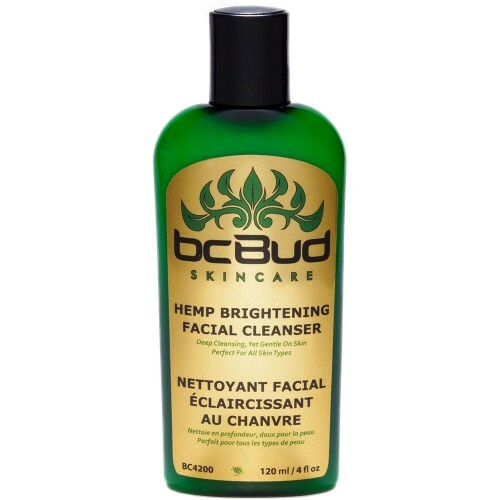 A few dabs of BC Bud Hemp Brightening Facial Cleanser, a splash of water -- nothing can compare to the clean, refreshing, residue-free feeling on your face; and the firm, glowing, healthy complexion in your mirror! This is the exact product that we sell to high-end spas, and now you can use it in the comfort of your own home without paying spa prices! - Ingredients: No sulfates, no harsh chemicals. Compare our ingredients to your regular brand! - Scent: This product has a light, fresh green tea scent, made from natural ingredients. - Lather: This product may not lather as thickly as a store-bought product. Most products use sulfates (a detergent and irritant) to produce rich lather. Lather does not cleanse; it merely looks and feels good. This product will cleanse as well (or better) without excessive lather, and without irritation. Deionized Water, Sodium Cocoamphoacetate, Decyl Glucoside, Sucrose Cocoate, Cocomide MIPA, Glyceryl MonoStearate, Hemp Seed Oil, Chamomile Flower Extract, Aloe Vera Leaf Juice, Cucumber Fruit Extract, Japanese Green Tea Leaf Extract, Emulsifying Wax NF, Optiphen, Carapex Moisturizing Complex, Fragrance. Dampen your face with warm water; gently massage cleanser onto your skin for 30 to 60 seconds; rinse thoroughly, pat dry. Tone and Moisturize your skin after.